An incredible revelation has come to light about the H.H. 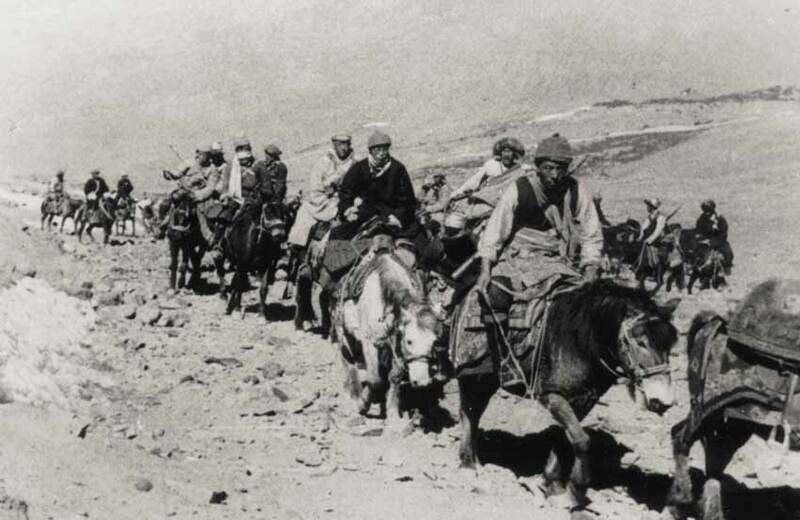 the 14th Dalai Lama’s perilous escape from Tibet, and the truth about who really saved his life during those most dangerous times. Some very courageous monks from both Gaden and Sera Monasteries have revealed many very interesting facts as below, which contradict what has been popularized. The truth has been covered up and denied by the Tibetan Government since the escape of the Dalai Lama and his people in 1959. First, it was under H.H. Trijang Rinpoche’s advice that the Dalai Lama sought the counsel of the enlightened Dharma Protector Dorje Shugden through the most famous oracle in the land, Panglung Oracle. By following Dorje Shugden’s instructions, the Dalai Lama escaped many terrible fates. For example, once, when the Chinese invaded the Norbulingka Palace (Dalai Lama’s summer home), they literally could not see the Dalai Lama and so he was not harmed. At that time, the Dalai Lama was carrying a Dorje Shugden thangka. Through the Panglung Oracle, Dorje Shugden advised the Dalai Lama to leave Tibet immediately and advised him which route to take. Dorje Shugden assured that he would protect the Dalai Lama. The Dalai Lama followed this instruction and left immediately. The day after, the Dalai Lama’s palace, the Potala, was completely shelled and bombed. He and his entourage were protected throughout the escape and arrived in India safely. The Gaden monks explained that the Dalai Lama had made an offering of THIS THANGKA PAINTING to his Guru Trijang Rinpoche. 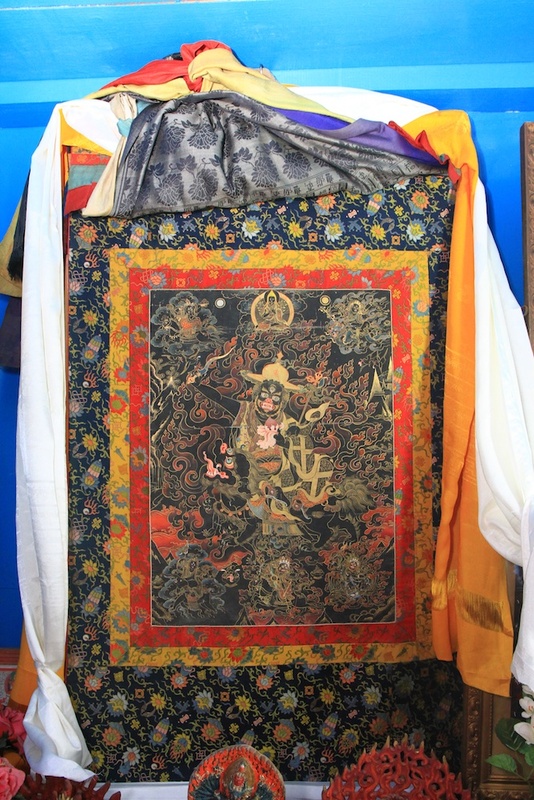 However, when he needed to escape Tibet, the Dalai Lama requested Trijang Rinpoche to borrow this thangka as protection. Knowing the tremendous benefit that the Dalai Lama would bring to the world through teachings and the Tibetan Buddhist lineage, Trijang Rinpoche immediately lent him the thangka. The Dalai Lama carried this thangka on his back throughout his escape towards India. All this points clearly to the fact that Dorje Shugden saved the Dalai Lama’s life and helped him escape unscathed from the dangers in Tibet. This thangka still exists and is currently preserved by the monks of Trijang Ladrang in Gaden Monastery. Now, the Dalai Lama has instituted a ban against Dorje Shugden, claiming that he is an evil spirit and will harm the Dalai Lama’s life. This is totally illogical! Why would Dorje Shugden help the Dalai Lama escape Tibet safely, and now be a threat to his life? Because of the ban, Dorje Shugden devotees have been attacked and families have been separated; monks are denied welfare and even expelled from their monasteries, which is unheard of in Buddhist history. The Tibetan exiled Government in India makes defamatory reports to the police about Dorje Shugden practitioners. They spread rumours that these practitioners are Chinese spies and even try to stop Dorje Shugden practitioners from entering India! Because the current young incarnation of Trijang Rinpoche continues to practice Dorje Shugden, there have been attacks on his life. Monks have revealed that masked men charged into Trijang Ladrang in Gaden Monastery carrying sticks and wanting to kill Trijang Rinpoche. Fortunately, many monks protected him. In 1995, because of the many threats on his life, the 15-year-old Trijang Rinpoche left India to America. The main reason he left the monastery was the many threats on his life due to this ban on Dorje Shugden. There is now talk among monks that the Dalai Lama wants to be the spiritual leader of all schools of Buddhism in the world, like a pope of Buddhism. He is achieving this by breaking apart smaller schools of Buddhism – such as by instituting this ban and creating splits within lineages so as to weaken them. It is his hope that when these schools are weakened and have no strong leader, he will be able to step in as supreme head to all Buddhist sects everywhere. (This is not what we at dorjeshugden.com endorse or agree with, but is what many monks are now led to think). 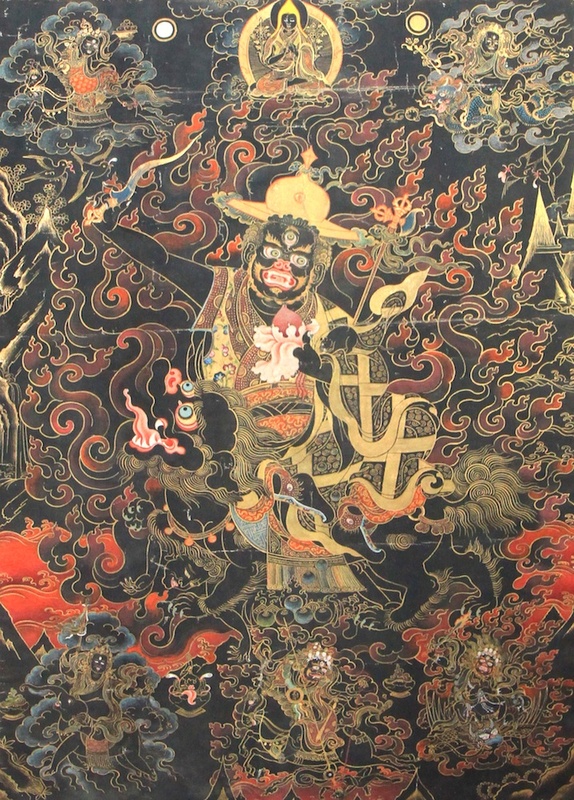 However, the revelation about the truth of this Dorje Shugden thangka now creates shockwaves in the Buddhist world. Underlying the ban, all its twisted “reasoning” and the misery it has created for Dorje Shugden devotees, THIS THANGKA reveals a whole different story. It proves that the Dalai Lama’s success today, and the success of all Tibetan Buddhist teachers, lineages and centers in the world, actually began first with the blessings and protection of Dorje Shugden as he led the Dalai Lama to safety. All the claims about Dorje Shugden being an evil, harmful spirit are completely unfounded and untrue. In sharing this, it is our hope that we can show the world the truth about Dorje Shugden, and that the ban can be lifted to allow more religious freedom and peace, tolerance and understanding everywhere. This entry was posted on Monday, December 19th, 2011 at 3:34 pm	and is filed under Featured, News. You can follow any responses to this entry through the RSS 2.0 feed. You can leave a response, or trackback from your own site.